SPAWN OF GRIZZLY. Big Grizzly styling tells the world where you're coming from. 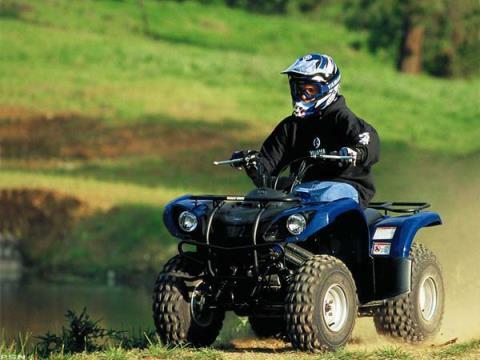 Yamaha-tough engineering makes getting wherever you're going a done deal. Dual 30-watt multi-reflector halogen headlights, set back in the front cowl, add the perfect menacing appearance. Taillight has an incorporated brake light. Large, two-gallon fuel tank provides excellent range. Independent A-arm front suspension with 2.8 inches of travel delivers a smooth, plush ride and responsive steering. Rugged swingarm packing a single rear shock with 3.2 inches of travel smooths out the bumps for a comfortable ride. Class-leading low, 27-inch seat height enhances rider comfort and keeps the center of gravity low for great handling. 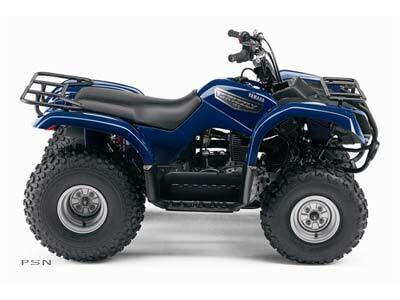 5.7-inch ground clearance allows smooth riding in a wide variety of terrain. Fully sealed front and rear drum brakes provide strong, reliable stopping power. Rugged 20 x 7-8 front and 22 x 10-8 rear knobby tires offer excellent traction and boost ground clearance. Powerful 124 cc, air-cooled, four-stroke single delivers reliable, smooth engine performance for all riders. Simple-to-operate selector knob lets you effortlessly select forward, neutral or reverse. Adjustable throttle limiter lets adult supervisor add power gradually as beginning riders over 16 years gain experience. Reliable, pushbutton electric start in any gear adds extra convenience and dependability. Rugged muffler with USFS-approved spark arrestor for quiet operation. Automatic cam chain tensioner reduces engine maintenance and extends engine life. Grizzly styling provides industry-leading good looks and durability, and a big Grizzly-style seat provides maximum rider comfort. Fully automatic V-belt transmission with forward, neutral, and reverse is simple to operate and eliminates the need for shifting. Tough, powerful 124 cc SOHC four-stroke single cranks out plenty of smooth, broadband propulsion. Rugged midsize steel frame fits a wide range of riders. Rugged steel cargo racks can pack a total of 33 pounds of combined cargo — 11 pounds up front and 22 on the rear. Simple to use handlebar-mounted parking brake and choke lever for added convenience. Wide front and rear fenders, with integrated full floorboards provide mud and splash protection for a dry, comfortable ride.